Continuing translations of Key Concepts in Intercultural Dialogue, today I am posting KC#71: Safe Space, which Elenie Opffer wrote for publication in English in 2015, and which Susana Maria de Almeida Gonçalves has now translated into Portuguese. As always, all Key Concepts are available as free PDFs; just click on the thumbnail to download. Lists of Key Concepts organized chronologically by publication date and number, alphabetically by concept, and by languages into which they have been translated, are available, as is a page of acknowledgments with the names of all authors, translators, and reviewers. Continuing translations of Key Concepts in Intercultural Dialogue, today I am posting KC#77: Negotiation, which Beth Fisher-Yoshida wrote for publication in English in 2016, and which Susana Maria de Almeida Gonçalves has now translated into Portuguese. As always, all Key Concepts are available as free PDFs; just click on the thumbnail to download. Lists of Key Concepts organized chronologically by publication date and number, alphabetically by concept, and by languages into which they have been translated, are available, as is a page of acknowledgments with the names of all authors, translators, and reviewers. Continuing translations of Key Concepts in Intercultural Dialogue, today I am posting KC#18: Intractable Conflict, which Andrew R. Smith wrote for publication in English in 2015, and which Susana Maria de Almeida Gonçalves has now translated into Portuguese. As always, all Key Concepts are available as free PDFs; just click on the thumbnail to download. Lists of Key Concepts organized chronologically by publication date and number, alphabetically by concept, and by languages into which they have been translated, are available, as is a page of acknowledgments with the names of all authors, translators, and reviewers. We are delighted to invite chapter contributions for the forthcoming book Art in diverse settings. We have signed a contract with the global academic publisher Sense and we expect to repeat the successful experience with the publication of our former book Art and intercultural dialogue (Sense, 2016). We plan to publish the manuscript one year from now. We have secured twelve chapters, which is a very good start, but there is room for more chapters (as we do not discard the possibility of a two volume publication) so we are still in the process of gathering new authors. Our aim is to guarantee the global scope, diversity of views, quality and relevance. You may find below the provisory table of contents (to review in accordance with chapter titles). We invite submissions for an edited volume concerning the role of art in diverse social settings. Contributions range from theoretical to methodological approaches, thus the chapters in the book can be seen as exemplary case studies, describing concrete intervention projects which use some form of art (photography, literature, poetry, music, drama, film, illustration, graffiti,…) or composed artistic expression (such as pop-art, street art, video-art…) as medium for communication in the contexts of social and professional organizations, public spaces or the community in general. The collection is intended to include a wide range of theoretical and methodological approaches highlighting a variety of conceptual, contextual and cultural issues. Please find below a list of relevant chapters/ themes for the volume. Should you be interested please send your biographical note (of aprox. 200 words), the title of your chapter and an abstract of 300 words to both Susana Gonçalves and Suzanne Majhanovich. Full papers (of aprox. 5000 words, including notes and references) will be due August 30th, 2017. Gonçalves, S., & Majhanovich, S. (Eds.). (2016). Art and intercultural dialogue. Rotterdam: Sense Publishers. How can art act as an intercultural mediator for dialogue? In order to scrutinize this question, relevant theoretical ideas are discussed and artistic intervention projects examined so as to highlight its cultural, political, economic, social, and transformational impacts. This thought-provoking work reveals why art is needed to help multicultural neighbourhoods and societies be sustainable, as well as united by diversity. This edited collection underlines the significance of arts and media as a tool of understanding, mediation, and communication across and beyond cultures. The chapters with a variety of conceptual and methodological approaches from particular contexts demonstrate the complexity in the dynamics of (inter)cultural communication, culture, identity, arts, and media. Overall, the collection encourages readers to consider themselves as agents of the communication process promoting dialogue. Susana Gonçalves, PhD is a Coordinator and Professor at the Polytechnic of Coimbra, Portugal, a researcher at the Research Unit for Education and Training/University of Lisbon, Director of the Centre for the Study and Advancement of Pedagogy in Higher Education (CINEP) and Secretary General of CICEA (Children’s identity and Citizenship in Europe Association). She has been a trainer for the Council of Europe, namely at the Programme Pestalozzi. Some of her edited books are Art and Intercultural Dialogue (with Suzanne Majhanovich, 2016, Sense), Diversity, Intercultural Encounters, and Education (with Markus Carpenter, 2013, Routledge), Intercultural Policies and Education (with Markus Carpenter, 2012, Peter Lang), Escola e Comunidade: Laboratórios de Cidadania Global (with Florbela Sousa, 2012, Universidade de Lisboa). 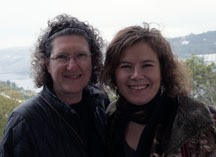 Her research interests include intercultural education, education, pedagogy in higher education, teacher training, and art. She is also a visual artist and a photographer. 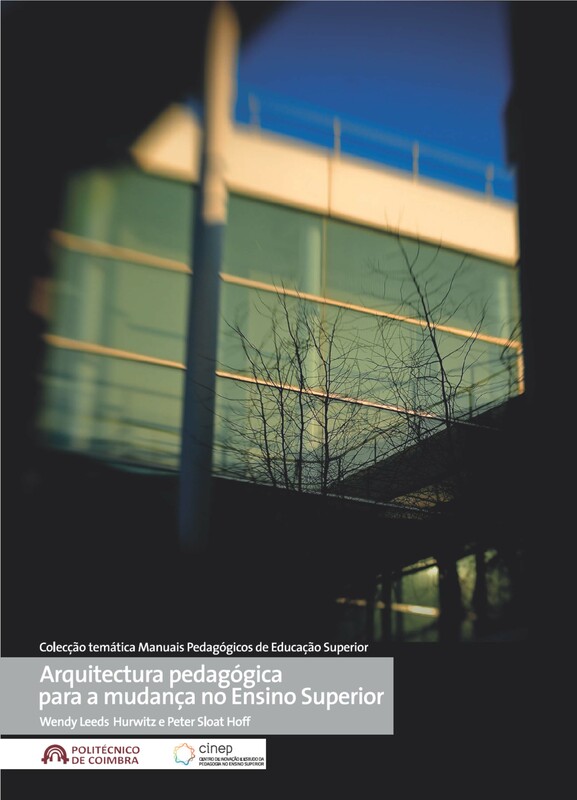 A publication resulting from my Fulbright in Portugal this spring has just appeared: Arquitectura pedagógica para a mudança no ensino superior [Pedagogical architecture changes for higher education]. For anyone who reads Portuguese, it’s available in electronic form here (there is also a hard copy version). For those who only read English, the longer book version came out in the fall, under the title Learning matters: The transformation of US higher education, published by Editions des Archives Contemporaines in Paris. Both the book and the monograph are co-authored with Peter Sloat Hoff. 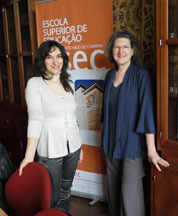 My thanks to Susan Gonçalves for accepting the manuscript and then seeing it through to publication with a series through the Centro de Inovação e Estudo da Pedagogia no Ensino Superior, which she directs and the host for my stay in Coimbra. Thanks also to all those who worked on various stages of the translation: Steven Pessoa, John Baldwin, Sofia Silva, Dina Soeiro and Susana herself. One thing leads to another. 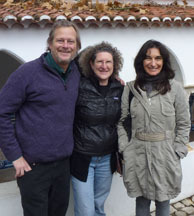 This is the story of how I became a Fulbright Specialist in Portugal. In May 2010 I retired from the University of Wisconsin-Parkside. In fall 2010 I applied to the Fulbright Specialist Program, and was approved in spring 2011. This program funds 2 to 6 week visits in 2 countries during a period of 5 years, including airfare and a daily stipend (host institutions cover room and board and in-country travel if it is necessary). In September 2011, while at a conference in Paris, a colleague found out I would be traveling to Portugal for pleasure. He provided an email introduction to a scholar there with overlapping interests, with the result that I was asked to give two talks at the Instituto Politécnico de Coimbra in November. There was a good fit between my project in France at that time (describing US higher education pedagogy) and the needs of a new teaching center at IPC, so I was asked to return for a longer visit. My host, Dr. Susana Gonçalves, is the director of the new center, Centro de Inovação e Estudo da Pedagogia no Ensino Superior (CINEP). She completed the necessary paperwork, and in spring 2012 the request was approved by both Portugal and the US State Department. Groups included one from the Engineering school interested in math pedagogy, and one from the Education school interested in reflective practice for preschool teachers. Individual consultations ranged even more widely, from very specific questions on a particular pedagogical technique, to more general questions about common academic concerns, including student motivation and integration of technology into courses. I was also invited to speak to students enrolled in a Master’s level course on marketing. While in Coimbra, I was invited to present several talks on my research at the University of Coimbra and the University of Lisbon. I also met with the company members of Project Llull, which uses theatre to start intercultural dialogues. In addition, I was able to connect some of the people I met through these various contexts with colleagues in the US or elsewhere having similar research, teaching, or administrative interests. On November 8, 2011, I presented a talk entitled “Intercultural weddings and the simultaneous display of multiple identities” to the Escola Superior de Educação de Coimbra, Politécnico de Coimbra, Portugal. 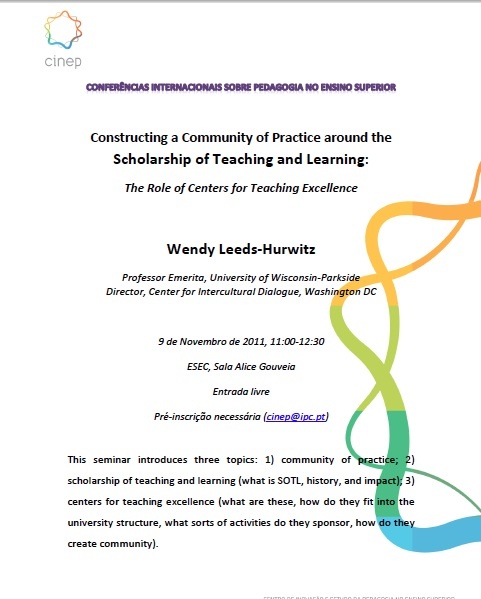 On November 9, 2011, I presented another talk entitled “Constructing a community of practice around the scholarship of teaching and learning: The role of centers for teaching excellence” to the Centro de Inovação e Estudo da Pedagogia no Ensino Superior, also part of the Politécnico de Coimbra. My host was Dr. Susana Gonçalves, Director of the Centro de Inovação e Estudo da Pedagogia no Ensino Superior (Center for Innovation and Higher Education Pedagogy) at the Politécnico. After the talk, Susana, her colleague Mark Carpenter, and Dr. Maria João Pinto Cardoso, the Vice President of the Politécnico, made time for lunch and followup conversation about future activities. My thanks to Susana for inviting me to come to Coimbra, and to Mark and his wife Carmo, for offering me and my husband gracious hospitality at their home for our few days in Coimbra. Mark and Susana made time to give us the grand tour of the old city. While in Coimbra, I had time to meet with Dr. Nancy Duxbury, a Canadian scholar I had not seen in several years, currently part of the Research Group on Cities, Culture and Architecture, a project of the Centro de Estudos Scoials at the Universidade de Coimbra. I look forward to future connections with all of these colleagues.